George Eliot's most ambitious novel is a masterly evocation of diverse lives and changing fortunes in a provincial community. 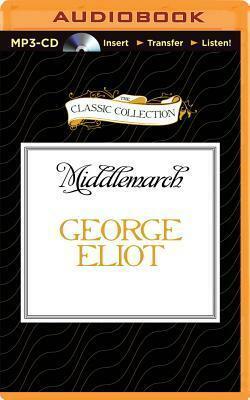 Set against the cultural and social fluctuations of the nineteenth century, Middlemarch features a vivid cast of complex characters. Peopling its landscape are Dorothea Brooke, a young idealist whose search for intellectual fulfillment leads her into a disastrous marriage to the pedantic scholar Casaubon; the charming but tactless Dr. Lydgate, whose marriage to the spendthrift beauty Rosamund and pioneering medical methods threaten to undermine his career; and the religious hypocrite Bulstrode who hides scandalous crimes from his past. As their stories interweave, George Eliot creates a richly nuanced and moving drama, hailed by Virginia Woolf as "one of the few English novels written for adult people."